Galen (130-200 AD). 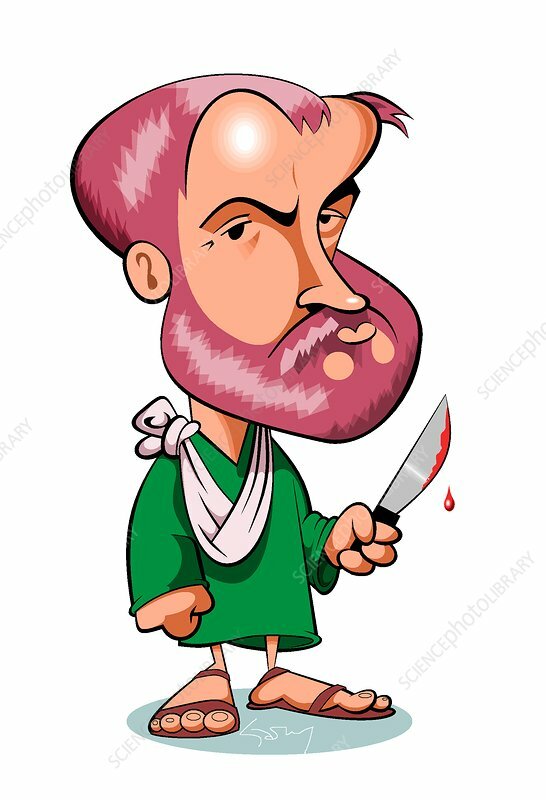 Caricature of the Ancient Greek physician Aelius Galenus, better known as Galen of Pergamon, holding a bloody knife. Galen was the first to use the pulse as a diagnostic aid and the first to describe the flow of urine through the ureters to the bladder. After his death, his body of work became a medical authority among Europeans until his views on anatomy were overthrown in the 16th century by Vesalius, and those on physiology in the 17th century by Harvey. In Galen's time, human dissection was taboo, and Galen's anatomical assumptions, which were based on animals, were not, as it was later seen, always applicable to humans.